There are numerous festivals across the UK celebrating literature and poetry in all its forms, and the best known in the South East is Wise Words. 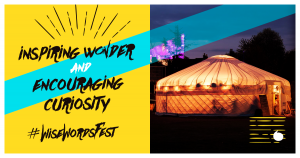 Organised on a shoe string budget and a strong smile, Beth Cuenco and Workers of Art programme, plan, cajole and magic the festival into being each year – often attracting some of the best known names in contemporary poetry from across the world. This year I visited with Anthony Anaxagorou to give a performance taken from the first draft of Songs My Enemy Taught Me, and discuss the concept behind the book. It was a packed event, and a rare opportunity for to be able to speak about my work and to answer any questions abut the notion of poetry reportage. Some of the women from that event came to the masterclasses, and one in particular had felt that she might be prevented from attending as she needed to bring her child with her ( or arrange expensive child care). This is something that needs to be urgently addressed across all the arts in the UK; when I began on the scene we made it a founding principle that all women should be able to attend events or workshops – with their child/children. We set up creches at gigs and in the theatres, or encouraged the children to be a part of the audience or workshop group. Somehow we have forgotten mothers, yet again. The Wise Words masterclass group consisted of women affected by domestic violence, university students, mature middle class women and a former Wise Words Slam winner. It was a good cross section of the Canterbury demographic – from the elite and educated to the silent working classes. The writing was extraordinary. There are a couple of examples of the poems here – and more to be uploaded once they have been emailed to me. As I don’t own the poems I am dependent in terms of this blog on the participants letting me take poems away or forwarding them on to me. Loved ones. Lost ones. The Missing. Their images contained within carved wooden frames. By those who stand defiant, with white knuckles, and bleeding hearts. and he will never let go.